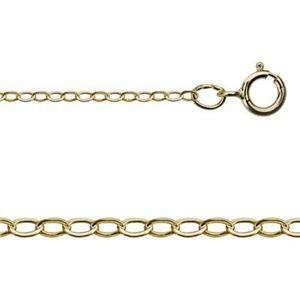 Our bestselling gold filled jewelry chain. This flat cable pendant chain is an easy to wear classic. Small links are still easily visible with a bright gold flash. Easily add pendants or focal links to jazz up this necklace building block. Shop our wide variety of gold filled jewelry blanks to make custom hand stamped additions. I love the shine and the slimness of this chain! It is my go to every time! Excellent quality chain, can fit 20g jump rings through the links.